The ordinance to take effect Jan. 1 caps the number of short-term units in non-owner-occupied buildings at 300 and requires hosts to pay registration fees. Beginning Jan. 1, people using websites like Airbnb to earn extra money by renting rooms and apartments on a short-term basis will be subject to new rules in Maine’s largest city. The Portland City Council voted 8-1 Monday night to set limits on the number of short-term rental units for non-owner-occupied buildings and to require all hosts to pay fees to register those units with the city’s Housing Safety Office. The rules are intended to protect Portland’s limited housing stock from being converted into short-term rentals, while allowing residents to take advantage of a burgeoning and profitable enterprise becoming more popular in many tourist communities nationwide, including Maine. 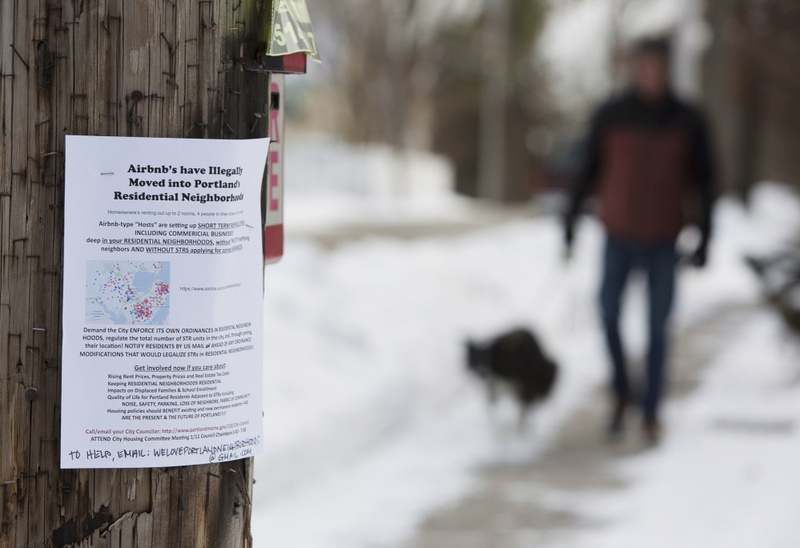 Portland officials have struggled for months to decide whether to regulate short-term rentals. While some communities don’t impose any regulations and others, like New York City, have banned them, Portland sought a middle ground that it believes will allow the practice while protecting its residential neighborhoods. But councilors warned that they still don’t know exactly how many short-term rentals are in the city, or the impact of the ordinance. It was that experimental nature that prompted Councilor Justin Costa to oppose the ordinance, particularly the cap on non-owner-occupied buildings. Although hearings on the issue often filled chambers over the last year and a half, only a handful of people testified in front of the council Monday night. Opponents like Ellen Sidar wanted the council to prohibit the practice, or at least set a limit on the number of short-term rentals allowed on one block. She noted that the city regulates bars in this manner. “Without regulating the number of Airbnbs on city blocks you will send our neighborhood into a death spiral,” said Sidar, who lives in North Deering. Ralph Baldwin, of the pro-short-term rental group Share Portland, asked the council to relax some of the proposed restrictions, including the citywide cap. But otherwise he supported the ordinance. “I think you’ve been very reasonable,” Baldwin said. The new rules will cap short-term rentals in non-owner-occupied homes, excluding the islands, to 300 units. And no individual, regardless of the ownership structure, will be able to register more than five short-term rentals in buildings in which they hold a financial interest. They will prohibit short-term rentals in single-family homes, including condominiums, that are not the primary residence of the owners. And no more than two people will be allowed to stay in each bedroom and only two people could use other areas, such as a living room, to sleep. There are more than 650 active listings for places to stay in Portland on Airbnb alone, the company says. Close to 200 of the rentals are likely rented out full-time, as a business investment, according to Tyler Norod, the city’s housing planner. According to Airbnb, the home-sharing service hosted 174,000 people in Maine and earned $26 million in 2016. Nearly a third of those people were coming to Portland, which booked 51,241 people, generating $7.1 million for hosts. Under state law, short-term rental hosts are supposed to collect a 9 percent lodging tax and remit it to the state. The only exception is for hosts who rent only one room for fewer than 15 days a year. In most cases, that host wouldn’t have to collect taxes, state officials said. However, Gov. Paul LePage’s budget would beef-up collections by requiring online booking sites for short-term rentals, such as Airbnb, VRBO or homeaway.com, to collect taxes on all of the units rented through their sites and send that revenue to the state. Airbnb recently agreed to collect the lodging tax and send it to the state. Owners will have to register their short-term rentals with the city’s Housing Safety Office. The revenue will be used to pay for the cost of the short-term rental program. Once costs are covered, additional revenue will go to the city’s Housing Trust Fund, which is used to fund affordable housing. Through fees and other limits, the rules also seek to discourage people from buying buildings for the sole purpose of converting them into short-term rentals. For example, the registration fee for an owner-occupied building will be $100 for the first unit, $250 for the second, $500 for the third, $1,000 for the fourth and $2,000 for the fifth. Fees for non-owner occupied buildings are higher, with $200 for the first unit, $500 for the second, $1,000 for the third, $2,000 for the fourth and $4,000 for the fifth. These buildings also face additional caps in terms of the number of short-term rental units allowed in each building, with only one short-term rental allowed in two-unit buildings, two short-term rentals in three- to five-unit buildings, four in six- to nine-unit buildings and five in buildings with 10 or more units. The escalating fees also will apply to units registered in different buildings by the same owner. Both Councilors Brian Batson and Spencer Thibodeau tried unsuccessfully to amend the rules. Batson’s bid to increase registration fees for non-owner occupied units by 50 percent was shot down, 5-4. Mayor Ethan Strimling supported any effort to increase revenues from fees. Councilors Pious Ali and Thibodeau joined Batson and Strimling in voting to support the higher fees. Councilor Jill Duson, who leads the Housing Committee, said the city may begin accepting registrations a few months prior to the ordinance taking effect in January. She said the committee also will review the impact of the ordinance after it has been in effect for six months.